Netflix (S NFLX) wants to become one of the major suppliers of 4K Ultra HD content in the coming months, and the company struck partnerships with Sony, (S SNE) LG, Vizio and Samsung to make that happen. Netflix showed off 4K video streaming with a trailer for the second season of House of Cards, which has been shot in the Ultra HD video format and will be available to devices supporting that format when the new season debuts in February. In fact, the trailer is already streaming in 4K on Netflix today – but there are no devices supporting playback available to consumers yet. That is poised to change due to the partnership with the aforementioned TV manufacturers. They will all add hardware H.265 HEVC video decoding capabilities to their new TV sets, many of which should be available in the next few months. Netflix will also announce additional 4K content in the near future, Evers said, adding that it won’t charge consumers extra to watch movies or TV shows in Ultra HD. The company’s 4K content will stream with a bit rate of 15.6 Mbps. Currently, Netflix’s best-looking content streams with as much as 7 Mbps. However, devices that support 4K will use H.265 HEVC for regular HD content as well, which will actually save bandwidth for that kind of content. 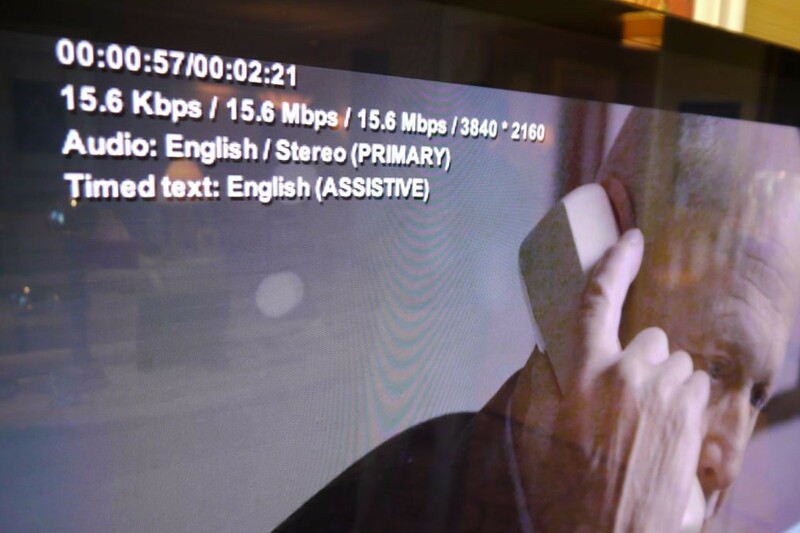 Netflix is streaming Ultra HD with a bit rate of 15.6 Mbps. Netflix isn’t the only company announcing 4K content at CES. Amazon(s amzn) also said that its Prime Instant subscribers will be able to access 4K videos, and the transactional VOD platform M-Go announced a 4K initiative as well. Even cable TV is jumping on the bandwagon: Comcast(s cmsca) announced a 4K video streaming app for Samsung TVs Monday — but the pay TV operator didn’t reveal any plans for making 4K available through traditional cable boxes and TV networks. This means that streaming could become how many viewers experience 4K first. “The internet is going to be the primary way of how people get Ultra HD 4K,” Evers agreed. As the industry is moving towards 4K, 3D seems to be falling out of favor. Earlier on Monday, Vizio said that it won’t be making any 3D TV sets at all this year anymore. Netflix doesn’t seem to be quite ready to give up on 3D yet, but Evers told me that its priorities are clearly elsewhere these days. “We have no plans to discontinue 3D, we have some new titles coming online in the future, but we are devoting all budget and energy on higher quality content towards 4K and future color and frame rate enhancements,” he said. Earlier on Monday, Vizio said that it won’t be making any 3D TV sets at all this year anymore. This story was updated on 1/7/2014 to with a quote from Netflix clarifying the company’s plans for 3D. It’s not only the lackluster 3D offerings that make it seem like there’s little interest in NF 3D…it’s the fact that so very few devices even offer it! (That includes the PS4 and Sony’s flagship 790 BD player). Leave it to the consumer electronics industry to blame consumers for their own shortcomings (and short-shortsightedness). what about the Xbox One? it supports 4K according to Microsoft.. All Netflix needs to do is make the app compatible. So, Netflix is cramming 4x as many pixels into a videostream that’s less than half of a typical 1080p Blu-Ray video stream. That’s going to look like complete $hit — but hey, it’s going to have > 8 million pixels…yay!!! 15.6Mbps HEVC is about equivalent to 31.2 Mbps of today’s bitrate. Super HD tops out at 7Mbps, and 31.2 > 4×7. So each quadrant should be equivalent or better than a Super HD stream. Super HD might not be Blu-ray, but it still looks better than almost any other video you can stream on the internet today. In theory, H.265 can improve on the compression ratio of H.264 by a factor of 2 but the jury isn’t out on this yet. The 2x efficiency figures of HVEC are in the most optimal scenarios, e.g. subsequent frames have considerable overlap with their predecessors (think slow motion scenes / stills), which is all fine and dandy, but the true test will be fast action scenes, sports, etc…where compression artifact can even be detected on current Blu-Ray streams. Again considering we’re now dealing with 4x as much data, there is almost definitely going to be a noticeable amount of artifact until the streams can be increased more into 50-60Mbps range. Considering it’s not uncommon to find a Blu-Ray stream in the 30Mbps range, consumers are going to need a pipe somewhere around 80-90Mbps to realistically see a 4k stream with the quality on par with a current Blu-Ray. …And the current Super HD streams have a tremendous amount of compression artifact. Big TVs are a reality these days which really showcase how low bitrate streams produce very noticeable defects. I totally agree with Britton – you want an Active GbE Fiber connection to the home to truly experience UHDTV. P.S. Do not confuse Active GbE with that from Google Fiber which is a shared GPON connection ! There’s a much larger problem here. The issue is that these big, expensive 4k TVs are going to be quite worthless for years to come. The FCC has no plans to make any sort of guidelines for 4k broadcasting, and once they doâ€¦well we saw how long it took them to implement HD guidelines in the first place. The second issue is with the film industry. Being somewhat in the film and entertainment industry (as a freelance mograph artist and compositor), I can say with certainty that film studios and distributors are not going to be very willing to offer 4k prints as home releases. Doing so would basically be allowing people to own a copy of the master print, which is detrimental to the value of the industryâ€™s work and a push for the piracy community. If you plan on buying a 4K screen, good luck viewing any content other than Netflix in its native resolution, unless you happened to have shot it yourself. There will never be 4K over the antenna. First, because getting all the companies and governmental bodies in line in a reasonable timeline is not going to happen. People would have to buy adapters for their old TVs (to downgrade the single to HD). The second, and more important reason, is that FOX and friends are not going to let you watch their 4K content for free, they are going to keep it behind a paywall. FOX isn’t even streaming their NFL playoff games for free, and as Aereo continues to grow broadcast disappearing becomes inevitable. 4K will just be streaming. I doubt discs or even cable boxes will be upgraded for the format. Re: Netflix & 3D: What a joke! The only titles available are junk (several made with NU-VIEW handycam 3d adapter!!) The good titles are UNAVAILABLE and have been for years! (Put in cart to see.) Typical trashing of 3d because they are in pursuit of cheaper content to sell subscription services. Anyway, as long as people have 2 eyes, 3d has a definite future. Why do I care about Netflix streaming 4k when they can’t stream my HD reliably? I get 30Mbps at my house and I can only stream HD Netflix around 20% of the time. HEVC generally halves the required bit-rate. So you should be able to get HD Netflix more often when HEVC gets implemented. I guess that’s why you should care about that part of the article. There is still a lot of potential in 3D- particularly for sports & movies, where you can properly immerse yourself in the on-screen action. Dang. I really like 3D. It adds an extra something to whatever you’re watching. B) There was very little 3D content available, with 99% of it being IMAX documentaries. Hope they kick 3D out soon enough. Useless gimmick. Is there any word on support for H.265 HEVC outside of the 4K TVs (maybe later this year)? Given the processor on the Roku 3 (which seems like overkill for video streaming considering some of the other Rokus can handle Super HD as well), I’m kind of hoping they can simply update it to take advantage of the promised bandwidth savings. I’d also be interested to learn how much real world bandwidth savings Netflix was able to pull off for their 1080p Super HD content. Also, a word on the picture quality you observed is always appreciated, since that is the only piece of information readers cannot see for themselves. Does Netflix 4K look noticeably better than Super HD? How about compared to other 4K examples at CES? Thanks for the article!